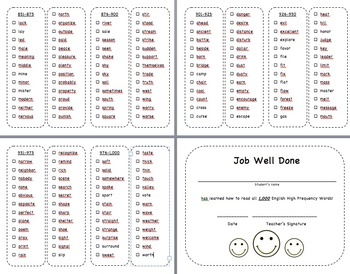 1000 high frequency words in English for students to practice on 22 sheets. Insert into sheet protectors and send home in a student binder or folder. You can add a sticker to each word they learn for motivation. There is a small certificate attached after the first 500 words and one at the end of the 1000 words to motivate the students. Get your students ready to learn these words! The red squiggles will not show up on the actual file.